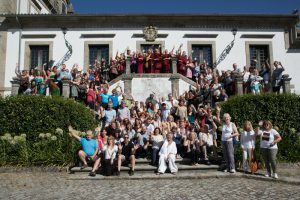 Using the deity as meditation practice, in particular White Tara, was the topic for this years summer camp held for the 6th time in northern Portugal. The venue was once again Casa da Torre near Vila Verde, and the delightful Portuguese sangha were as welcoming as ever. 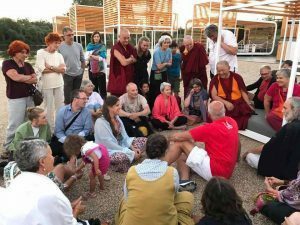 It is always lovely to meet so many now familiar faces after twelve years of Bodhicharya Summer camp retreats here and in France since 2006. The warm weather and fresh vegetarian food laid the ground for a spiritually nourishing week with Ringu Tulku Rinpoche. Ringu Tulku Rinpoche spoke at the outset of his teachings of the need for healing – not only for each of us personally, but for the whole world. He reminded us that when so much negativity is freely shared – especially in the news and on social media – it becomes the dominant preoccupation with the power to wipe out all that is good, he also said the negativity will contribute to our attitudes and experience in an unhelpful way. Rinpoche ascribes to the Vajrayana many functions. For instance developing the habit of keeping a balanced perspective between good and bad is of paramount importance, because the purpose of all our practice is to train our minds to generate wisdom and compassion and cultivate cogent positive aspirations that will prompt optimistic responses counter to the pervading darkness that brings fear in its wake. He spoke a little on the meaning of dharma, and the relationship of dharma with Buddhism: doing what is good for others that is transformative for ourselves is one way of living the dharma and in that sense, Buddhism is dharma; however dharma is not only bound into Buddhism alone, there are many dharmas and dharma paths. A person living a good life that is kind and ethical is living their life in accordance with dharma. In Buddhism there are many levels of teachings, but it is really important that we each find our own level and capacity. According to Atisha there three types of being: those who want to have a happy and peaceful life for themselves alone; those who want to know how both to live and how to die – which entails deep inner work on the emotions; and those who recognise that lasting happiness comes from concern for the welfare of all beings on a material and spiritual level. This third group are the Bodhisattvas, who are not content with personal happiness only – these, Ringu Tulku said are the ‘unappointed friends’ whose sole purpose is to help each of us to find true lasting happiness. So in this way, there is no concept of a stranger. The Tara text we were studying is a short version that was written by the previous Tenga Rinpoche and provides a simplified practise that is also suitable for newcomers, at the same time providing an extraordinary depth of experience and insight when practised properly. 150 participants attended the teachings from many parts of the world, including new and not so new students, young families from Mexico and Panama, friends from the US, Scandinavia, Thailand, the Canaries, Ireland, UK and mainland Europe. Some came just for the duration of retreat, and others for a longer vacation in Portugal. The timetable was not too strenuous: dawn was heralded by a cacophony of yelping village dogs and crowing farmyard cockerels, preparing us for an early morning group meditation led by Francois. The meditation period was in turn accompanied by the excited calls of a gaggle of geese who at 7.30 each morning were set free from their night time roost in the barn on the far side of the vineyard. Later in the week an owl attended our sessions, at the start of each period it came to sit quietly on the eve of a roof just outside the shrine room window, and left just after we had finished. It seemed White Tara was also being summoned by the animal realm. Our formal Tara practice sessions twice per day in the shrine room were led by Ani Wangmo and Ani Paldron, and between us all we accumulated well over the one million mantras as suggested by His Holiness Karmapa, to be dedicated to Rinpoche’s long life and good health. Rinpoche taught two sessions per day, morning and late afternoon, when he gradually went through the practise text and gave instruction. The talks were occasionally diverted or punctuated by stories and jokes, either to illustrate a point, or to wake the dozing students sitting in front of him as they struggled to concentrate in the sometimes sweltering heat during the post lunch period. There was daily yoga under the orange trees in the cloisters, and teaching sessions with Lama Tsultrim for those new to dharma, when he explained any missing detail and gave the opportunity for further questions. The warm evenings lent themselves to strolls by the river and an ice cream with Rinpoche, and hallelujah! the unusual absence of mosquitoes permitted night time windows to be left open to the moonlight and the sound of crickets calling Tara to the cornfields. On the final day Ringu Tulku gave the Wang, or Empowerment, a ritual that lasted 2.5 hours, but passed as a mere moment in time, bringing blessings like snowflakes falling upon a lake – permitting and empowering the recipients to practise. Rinpoche’s presentation elaborated on the shiné, vipassana and mahamudra aspects of the practice clearly and simply, his exemplary delivery of the sadhana left many of us spellbound, and no one in any doubt as to the treasure we were being gifted with by a truly special spiritual friend. Next year summercamp will run from Wednesday 1st August until Tuesday 7th August, at Casa da Torre, Vila Verde, Northern Portugal. Mark it in your diary.